Samuel Kerr says that Barack Obama could learn much from the Clinton Presidency. Barack Obama’s historic election to the Presidency in 2008 saw a wave of affection across the nation. Very few newly elected Presidents would have ever experienced such widespread jubilation; Obama was seen as a change from the status quo – a President for a new generation and a breath of fresh air. I am a fan of President Obama. I think he was the right man at the time and I believe that it was the right thing for him to be re-elected in 2012, especially given the direness of the GOP’s offering. However, there are many things about the President’s time in office that make me uncomfortable. The increased use of military drones by the Obama administration is deplorable in the extreme, not to mention entirely unconstitutional. The fact that Guantanamo Bay has still not been closed down remains a big disappointment for the President’s supporters. Furthermore, Obama’s use executive privilege to shield the attorney general in the Fast and Furious scandal was opportunistic in the extreme. However, the most disappointing facet of the Obama Presidency has been his immovability on legislative issues and his refusal to negotiate with Congress. It was his early refusal to consider Tort Reform that hardened Republicans against his healthcare reforms and resulted in the watered down version that we now see in ‘Obamacare’. It was the refusal to move on Tort Reform that put the final nail in the coffin of the Public Option, and in fact anyone with a degree of sense in the US will confirm that it is currently far too easy to sue your doctor. Something must be done about it. The President has painted himself as the standard bearer of his party. Yet the role of a President is really to be above party politics. This has also hardened Republicans against him and guaranteed that they will vote against him no matter what, even to the point of Senate Minority Leader Mitch McConnell telling his party’s senators that any movement on gun control would be a victory for the President, which they could not allow. This has been one of the worst periods of deadlock in history and has many in the President’s own party wistfully extolling the virtues of a famous Democrat called Clinton. However, I am not talking about Hillary, the perennial Presidential candidate who polarises the country almost more than Obama himself. I am speaking of her husband – the ‘comeback kid’ and highly capable negotiator who is currently the most popular living American politician: Bill Clinton. 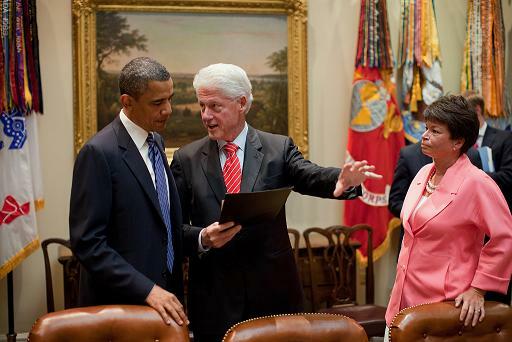 President Clinton was, without a shadow of a doubt, a controversial President. However, he was a masterful negotiator whose legislative record while dealing with a hostile Republican congress stands as a testament to his powers of persuasion. Even his greatest foe in office – Speaker Newt Gingrich – claimed, whilst running in 2012, that President Clinton had been ‘a real president’. In the 2012 campaign Republicans were falling over themselves to praise a man they had once demonised, proving President Clinton’s lasting appeal to the majority of Americans. Under Clinton, Congress passed gun control reform, reform to healthcare, gay rights legislation, budgets, and the United States saw one of the greatest periods of economic prosperity in its recent history. The reason why this happened is because President Clinton was ready to negotiate, to find a compromise and a third way. He disappointed many liberals, but even after the embarrassing Lewinski affair, Clinton left office with record high approvals. His successes is why he was given a louder ovation at last year’s DNC than the President, his speech at that particular conference being the finest of the political season that year. President Clinton achieved progress in the Middle East peace process, was involved in peace in Northern Ireland and was widely respected around the world. Naturally, he had his faults, and they are well documented. However, he was a true President – a man who sought to represent all Americans above party interests. American political humourist Jon Stewart claimed in the build-up to the 2012 election that, if he could run again, President Clinton would be elected in a landslide, something his conservative counterpart, Bill O’Reilly, wholeheartedly agreed with. President Obama has another term now. He does not need re-election. If he wants to achieve something lasting, he would do well to learn a lesson from the last President his party had in office. Crucially, he must be prepared to negotiate. The Presidency is not about party politics or polarisation, but unification. In Obama’s own words: ‘There are no Red States or Blue States but the United States’. He would do well to remember that in his second term and perhaps, in years from now, people will talk of him as fondly as they do of President Bill Clinton.